Peacock feathers are beautiful and made up of many different brilliant colors. 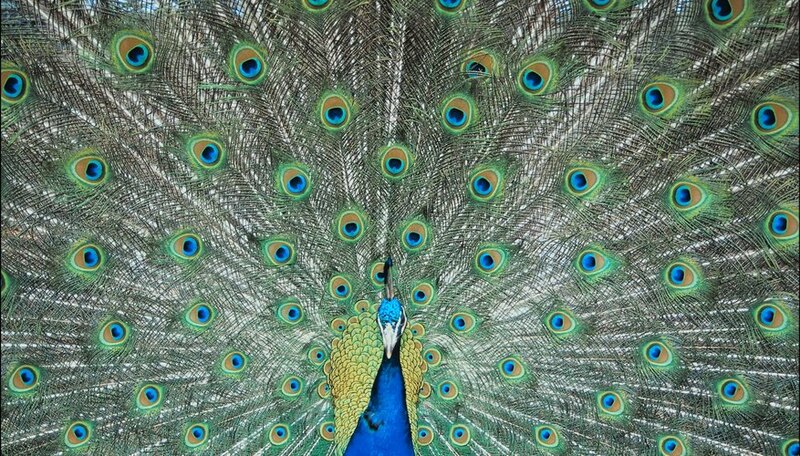 The long, eyed feathers that you're probably familiar with are the feathers of the male peacock. Peacock feathers are used in numerous crafts and are the focal point in many paintings and drawings. Drawing a peacock feather is surprisingly simple: Concentrating on one portion of the feather at a time will allow you to achieve a well-drawn, accurate final result. Draw the feather's basic stem shape with a black colored pencil. The stem can be as long as you want; it's shaped like a very skinny rectangle, so slim that it almost looks like a line. At the top end of the stem, add a large, circular shape. The finished product should almost look like a lollipop. Use the same black colored pencil to draw a smaller circle within the large one. Inside that circle, draw a shape that looks like a bean. Color the bean shape dark blue with a bright blue outline. Color the inner circle of the feather tip yellow. Use a green colored pencil to create the wispy hairs of the feather. These hairs should sprout from halfway up the stem and continue all the way up around the top circle. Draw the wisps gently and make them point upward as you go. Use different shades of green to complete the feather wisps.